I watch way too much sport for my own good. NBA, NFL, football, Aussie Rules, you name it. I am totally a sports junkie, and when I watch good ultimate it has all the spectacular plays, heroics and drama of the others, just not the professional production quality. 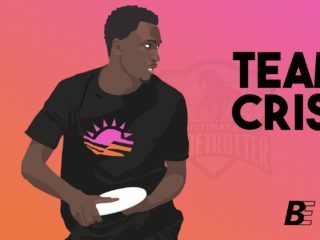 What if we re-invented ultimate for television? And by television, I mean broadcast. No one watches TV anymore. 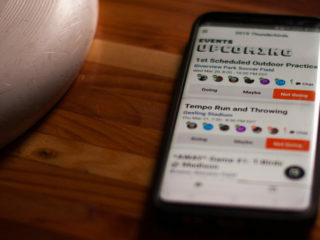 Many other sports have variations on the rules and better use of technology at higher levels specifically with broadcast in mind. 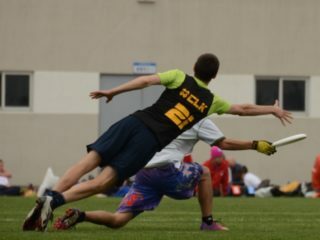 Ultimate is at an exciting stage, with pro-leagues in the US and talk of the Olympic Games. What better time to have a look. Just imagine what ultimate would look like if we had an unlimited budget? Did you know that poker machines are designed to keep people chemically engaged? In our quest to get rich, poker machines create near misses and “false wins”. These near misses release dopamine and keep people putting money into the machine. It is pretty messed up, if you think about it. Even the musical tunes the machine plays are designed to be hypnotic! What has this got to do with ultimate? Well, I got to thinking. I’m hooked on sports for the same reason: the near misses, the drama and excitement. Boatloads of dopamine are being released constantly while watching sport. No wonder I’m hooked. And it turns out this has scientific backing. 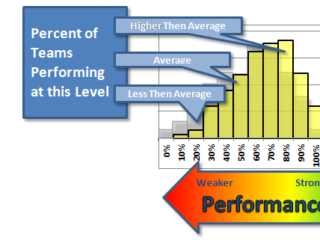 So what specifically is it about sports that have this effect on people, and what aspects of ultimate fit this mold. If, say, ultimate needed to get major sponsors on board, we’d need major viewership. And if we needed major viewership, we’d have to make our broadcast compelling enough to attract ultimate and non-ultimate fans alike. So what aspects of ultimate get the dopamine flowing? Look, I’m not a scientist. I’m not going to be able to run a double-blind study on what specifically in ultimate generates a dopamine spike for viewers. But I can certainly hypothesize. My intention here is to spark debate and gather ideas from the ultimate community. Then, hopefully, we can create some trial broadcasts to test how some of the ideas work. Here are some of my ideas on what would make a more compelling ultimate broadcast. Please comment below if you have feedback and any other ideas, everything is on the table. In the NBA, you have a shot clock that shows viewers when players need to put up a shot by. This was invented in the 1950s because players would sometimes take forever to actually shoot a ball. Imagine a game as low scoring as 19-18. This happened in the NBA because the shot clock didn’t exist and players had no reason to shoot the ball. Today, the shot clock adds that extra bit of drama in to keep players shooting, and scores and excitement high. We actually have this in ultimate too. It’s called the stall count. Why shouldn’t viewers be able to share in this excitement and anticipation for a pass as well? An on field shot clock that turns red. Perhaps there is an audible tone or beep at 2-3 seconds to go. We would have to start the count when possession is established (rather than when a mark is established) or have the marking player indicate that he is guarding for the stall to start. Most stall counts counted stalls are only 7-8 seconds anyway if you’re lucky…What would be a good number? Making replays of plays available to the players to assist with self-officiation. Who could argue with a clear replay? This is similar to the coaches challenge in NFL, perhaps each team has 3 challenges per game. Decision could be referred to team captains first, then non playing third parties selected by each team. Could involve a Game Advisor too perhaps. Hopefully having the ability to refer a decision will short circuit long call discussions and stop bad calls from changing the result of close games. If we go with replay challenges, something that is difficult to see is if your toe caught a grass blade before your heel landed on the line. In the NFL if your toe hits first inbounds and your heel comes down out of bounds it is out. I think we need some clarification like this if we are using replays to determine close in and out calls. Nothing stops the dopamine faster than thinking your team has scored on an endzone break throw to win and it gets called back for a pick when there was no way the defender would have had a play. No idea what this rule should change too…I get that we don’t really want to create intentional screens…what is a good balance? The USAU have made some changes in this area, are they enough, what should we do different? For heaven’s sake…XXXL shorts that nearly hit your ankles are NOT COOL. Players have athletic legs…let’s show them off! Think of the viewer numbers! Aussie Rules Football in Australia have over 45% women at their games (I’m not saying that all women like hot man legs, I’m just saying that over 45% of people that attend games are women). The tight jerseys and shorts may be helping! The NFL has this and it looks awesome. It’s easy to see in and out calls live and on replays. If we’re going to continue with self-officiation discussions (which is a whole can of spam that currently is the law of the land under WFDF rules), we should get audio and bring the viewer into the on field discussion. It would go a long way to ending confusion about calls and keeping it interesting. In addition we could link the commentators to the Game Advisor for further explanation of the rule/call. We did some of this at WUGC this year, did you like it, what could we do better? Remove timeouts during play – Are they really necessary? Make all turnovers like a 4th down turnover in NFL – Disc comes to where the thrower was. This way you can’t just punt it downwind, which should lead to more turnovers near the upwind endzone, and therefore more upwind scores. Get rid of the pull – Pulls take too long. Make it some form of backwards self pass, like how you start play in soccer after a goal. Remove the need to be perfectly still and in the exact same spot after a stoppage – Lots of time is wasted as people move back to the right spot. The MLU and AUDL does this. Better stats – Where on the field results in the most turnovers? What type of throw? Keep stats on spirit things – Discussions, uncontested, etc. Put your spirit money where your spirit mouth is and highlight it quantifiably. Increase the distance the marker must be from the thrower – Make it 1 metre. This would remove almost all foul and contact calls. So many sports are based on how much you can get away with. There is diving, simulation and all sorts of ugly stuff. I think self refereeing really adds to the drama of the game. I am talking full self refereeing WFDF style where the ultimate decision is with the players. I’m not for long stoppages and ugly arguments, but I am for discussion and teaching conflict resolution. I am for promoting human drama and character. Imagine if a good spirited no call, or retraction made the sportscenter top 10? So how can we prevent those long stoppages and ugly arguments? Any ideas? How could we leverage technology to solve this? Can Game Advisors do more? There are so few mixed field sports in the world. This is a huge competitive advantage to ultimate. 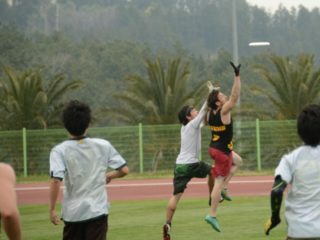 Good looking guys and girls running around playing high level ultimate, I would watch that! I really like that when the time cap goes, your team may still have an opportunity to come back. Some of the most exciting games I have seen have been 4-5 point runs to win after the buzzer. This removes junk time as the clock counts down when your team is down. However there is a good case that the buzzer beating scores and overtime in the pro leagues are good dopamine releases. Look there’s no silver bullet that’s going to make ultimate more appealing to a broader audience. And even if we magically stumble upon that perfect formula overnight, it’s not going to generate the masses immediately. The masses will come, but I want ultimate to be prepared with the most compelling broadcast possible when they do. So let me know your thoughts. What would the perfect ultimate broadcast look like?